Money stresses, we all have them at some point in our lives. They might be long term money stresses like overwhelming debt, or short term ones like a sudden, unexpected bill. I think it’s safe to say we’ve all been there. Stress can be useful for keeping us focused but when it becomes persistent and negative it can do serious damage to our health and well-being. If you’re constantly swimming in a pool of cortisol, the effects can also splash over to your relationships with loved ones. Like every source of stress, the trick to dealing with money stress is actively managing it. It feels like your home-ownership dream is slipping away. The rule of thumb for emergency funds is three to six months of basic living costs. That’s a lot of money. Even if your living expenses are very low, the thought of saving even three month’s worth is intimidating. Six months can be pie in the sky stuff! Start with $1000 and build from there. Once you have that first $1000 in the bank, you’ll have the confidence to tackle the more challenging money stresses like your debt. Once your debt is taken care of, come back to your emergency savings and aim for enough to cover your living expenses for three months. What ranks as overwhelming is deeply personal. If your debt stresses you out, whether it’s $1,000 or $100,000, you need to start managing it. Make sacrifices if you need to find extra money in your budget. Track your spending to see if there are areas you’re wasting money that could be better spent on reducing your debt. 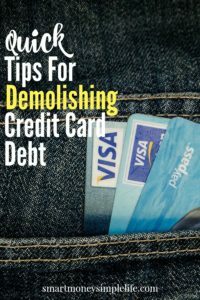 Check out these posts for step-by-step instructions to sort out your debt and get rid of the number one source of money stress for most people; debt. Funding your retirement can be a major source of anxiety, especially if retirement is just around the corner. Of course, the best time to start saving for your retirement is when you first start working. The second best time to start is today. If you can’t dedicate vast sums toward your long-term savings, at least contribute something. As you gain more control of your financial life you can increase your contributions. A great way to amplify your ability to save for retirement is to start a side hustle. Earning extra money beyond what you can earn through your usual job enables you to fast track your retirement savings, and maybe, you can retire early. You might also find you love your side hustle so much, you make it part of your lifestyle and have the best of both worlds; work you love and a lifestyle you don’t need to retire from. Frugal living doesn’t have to boring. 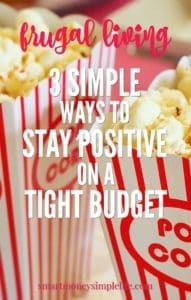 Read on for 3 simple ways to keep your spirits up when money is tight. Sometimes it’s not the Jones’ we stress about keep up with, it’s our closest friends. If you have friends who earn a lot more than you or who are perhaps a bit more spendy than you are, it can become a source of stress. Instead of agreeing to expensive outings, look for ways to catch up that won’t break your bank or make you feel like Ebeneezer Scrooge. Try lunch, instead of dinner. Or, instead of lunch, try coffee and cake for morning or afternoon tea. Organise a themed movie night at home. A picnic in the park. A walk and talk session. You get the idea… Catching up with friends doesn’t have to mean destroying your budget. And, speaking of budgets, try allocating an amount in your budget to go toward a guilt-free night on the town with friends. Depending on where you live, the dream of home ownership could be quickly becoming unattainable. If owning your own home is important to you, accept now that your first home won’t be your dream home. Sometimes, getting a toehold on the market means starting with a property that’s not necessarily where you want to live or as big as you want or in the condition you want. Start with what you can afford then work at adding value to your home while reducing your mortgage as quickly as possible. A fixer-upper might be your best option if you’re starting out. Again, depending on where you live and, just as importantly work, home ownership might be completely out of your reach. If that’s the case, consider the best way to pay rent and invest in properties for others to live in. It would be nice if ignoring your problems really did mean they went away but in my experience, problems are the only things that actually grow when you neglect them. 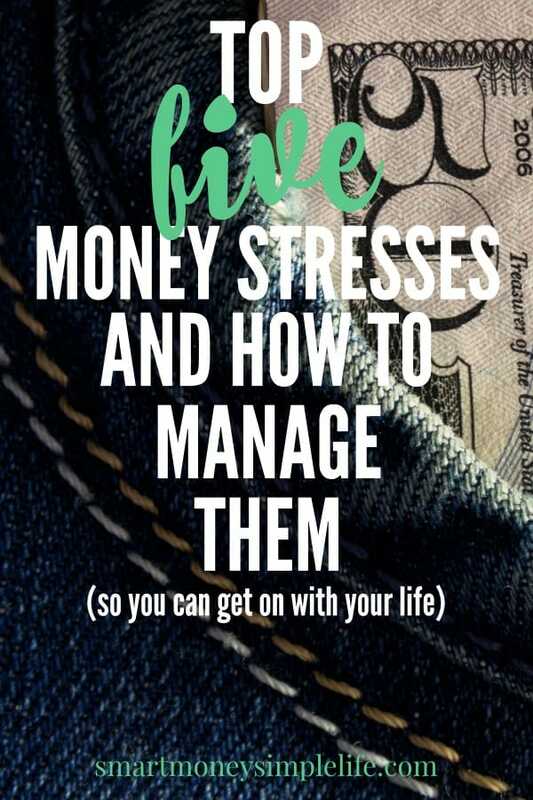 If any of these five major money stresses are a part of your life, start actively managing them today. So, pick whichever one stresses you out the most and start making a plan to manage it out of existence. What other major money stresses you’d add to this list?